BRAMMER, the pan-European distributors of industrial maintenance, repair and overhaul (MRO) products, have fully united their 11 wholly owned and previously individually named national businesses under the Brammer brand to become a single trading organization across Europe. Chief executive Ian Fraser said: ‘Cost pressures on European manufacturers of all sizes are considerable. Any opportunity a supplier can offer to help reduce their operating and purchase costs, at the same time as improving their production efficiency, is always welcome. As authorized distributors for leading brands such as SKF, NSK, Renold, Gates, Flender, Siemens, SMC, Norgren, Rocol Loctite and Schaeffler UK, Brammer’s product range includes bearings, mechanical power-transmission products (including gearboxes and motors), pneumatics, hydraulics, seals, and industrial automation, as well as a complete range of tools, maintenance and health and safety products. The creation of a single pan-European Brammer brand recognizes the growing number of multi-national customers who want a single-source supplier with common products, operations and services across all their European sites. 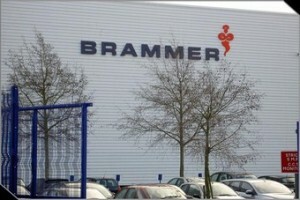 Brammer say customers will benefit from access to their 2.5 million parts inventory across the whole group, and that if a local branch or national distribution centre does not have a particular part, it will be quickly sourced and delivered from one of their other European distribution centres.